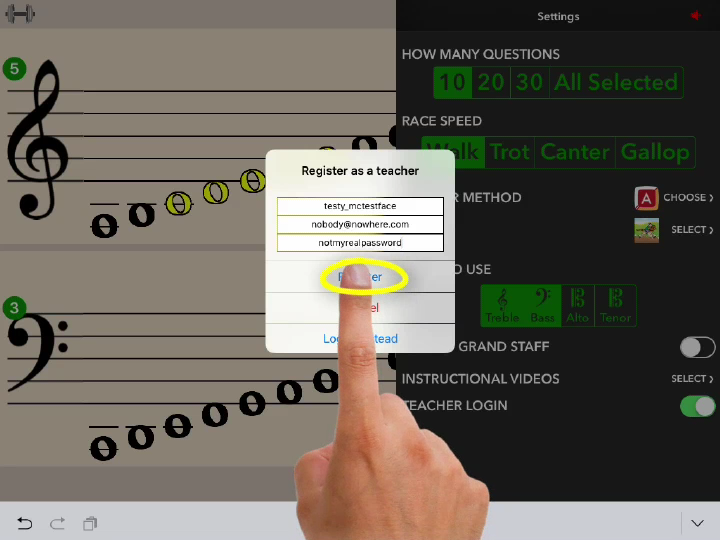 If you wish to be able to send preset drills to your students via email, you need to first create a teacher account. Scroll down in the settings panel until you get to Teacher Login. If the Teacher Login switch is not turned on, you are not logged in. Tap the switch to turn it on. If you have not yet created an account, tap Register Instead to create a new account. Choose a username for yourself and then supply your email address and a password of your choosing. Then tap Register. Check your email inbox for a confirmation email. You must tap the link in this email to confirm your email address before your account is activated. Remember You must click the activation link in the confirmation email before you can send drills to your students. It is best to leave yourself logged in so you can send drills to students without having to re-enter your credentials. Rest assured! Your email address will never be shared with any third parties.